30 Rock is dead; long live 30 Rock. Tina Fey’s acclaimed comedy, based on her experiences as a writer on Saturday Night Live, was one of the funniest shows on television for much of its seven-season run. Long after its series finale, its influence remains evident in shows like Unbreakable Kimmy Schmidt, Fey’s recent Netflix collaboration with Robert Carlock, and NBC’s new (and recently renewed) sitcom Great News, which in many ways feels like the most obvious heir apparent. It was created by 30 Rock veteran Tracey Wigfield and features Fey and Carlock as executive producers, and the fact that it takes place in a New Jersey news studio makes it a workplace comedy that functions in much the same way that 30 Rock, with its eponymous setting, did. Fey’s influence on Wigfield, then, is clear, but Great News isn’t always operating at the same level as its most obvious creative influence (then again, few recent network comedies are). 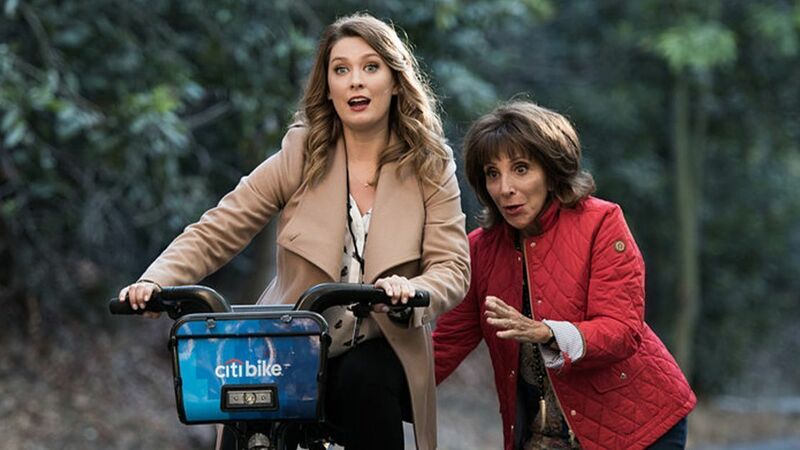 For one thing, it starts with a rather cutesy conventional premise: the professional and personal lives of young producer Katie Wendelson (Briga Heelan) collide when her mother Carol (Andrea Martin) takes an internship at her office. The narrative beats in the pilot are familiar, as Carol’s fumbling attempts to adjust to her new environment throw Katie’s world into chaos, and it seems as though the elder Wendelson isn’t cut out for the job. However, she proves herself when it becomes clear that she’s the only person in the newsroom capable of managing Chuck Pierce (John Michael Higgins), the preening anchor of the aptly-named news show The Breakdown, whose barely-concealed insecurities cause him to make life miserable for everyone around him. It's Martin and Higgins who are, so far, the main reasons to watch Great News. Their rapport and comic timing in their scenes together are delightful. Martin applies the same light, breezy touch that’s made her so enjoyable in recent series such as Hulu’s Difficult People, while Higgins manages to inject just the right amount of pathos – Chuck’s keenly aware of his advancing age, and of the ruthless attitude that audiences and network executives take towards someone the moment they appear to be past their prime – into what’s otherwise a broad, blustering role. Wigfield and her co-writers’ dialogue is predictably funny, but it takes Martin to carry some of it over the top, such as the moment in which Katie complains of having been kept in a gilded cage all her life and Carol dismissively exclaims, “That was one time!” The joke’s structure is familiar, and it’s meant to be a throwaway line, but Martin’s offhand delivery makes it funnier than it ought to be. Speaking of Wigfield, who has an amusing recurring role on the show as the studio’s eccentric meteorologist, her writing is generally sharp, although it’s hard to shake the feeling that this is a show that’s somewhat hampered by network notes about making the characters relatable and not too bizarre. You get the sense that Great News could have really let its proverbial freak flag fly on an outlet like Netflix or Amazon, and early episodes (I’ve seen the first four) start to hit similar notes: will Carol’s age and endearing unfamiliarity with twenty-first century technology and culture lead to disaster and cause her to give up? Spoiler alert: they will not. There’s a noticeable shift in tone in the third and fourth episodes (30 Rock veterans Jack Burditt and Robert Carlock share primary writing credit for the latter), which start to channel some of the weird energy that made 30 Rock unique and which also establish The Breakdown as something of a constant disaster. There’s a hilarious sight gag – in the most literal sense of that term – involving Chuck's attempting to soldier through a newscast after cataract surgery that represents the show’s best effort thus far to build and maintain a narrative and comic throughline until it reaches a satisfying (if slightly horrifying) payoff. a deadpan tone that, if used sparingly, may prove to be one of the show’s secret strengths. The days of NBC as “Must See TV” are past, despite the network’s best efforts to revive them by bringing back older hits like Will & Grace. However, with overall creative successes such as Great News, as well as The Good Place and Superstore, it can now boast of a handful of comedies that, while not nearly up to the standard of The Office or 30 Rock or Parks & Recreation at their peaks, can nevertheless withstand some comparison with their forerunners. – Michael Lueger teaches theatre classes at Northeastern University and Emerson College. He's written for WBUR's Cognoscentipage and HowlRound. He also tweets about theatre history at @theaterhistory.